The Michigan Municipal League has identified eight assets that make vibrant communities, such as walkability, cultural and economic development, green initiatives, education, multiculturalism and entrepreneurship. The League is continually visiting Michigan communities to view these assets in action. 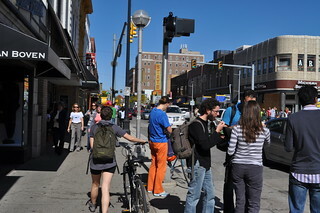 The League’s main office is in Ann Arbor so we’re frequently downtown. Ann Arbor is one of the state’s top communities for placemaking and embodies many of the placemaking assets people seek today - an array of businesses, restaurants and shops within easy walking distance from residential neighborhoods, public transit, entrepreneurship, cultural amenities, such as art sculptures, a public gathering spaces, and an overall inviting environment. The League believes that Michigan’s cities are vital to the state’s economic turnaround and that better communities will result in a better Michigan. Learn more at mml.org and mml.org/placemaking. For more about placemaking go to placemaking.mml.org: placemaking.mml.org. You can also visit a placemaking blog by League CEO Dan Gilmartin called www.economicsofplace.com/. For more about the League and what we do go to mml.org.